The Royal tour of Australia in 1954 was, at the time, the single biggest event the nation had hosted. The organisational undertaking was immense, with all correspondence between those involved done by hand-written letters and telephone calls. Official printed programs from the Royal tour stated that all those responsible for an event were to synchronise their watches with the ABC time signals at 9am each day.3 The eight week tour took place during summer when temperatures reached upwards of forty degrees centigrade in some areas of Australia. Despite the punishing heat and humidity, the monarch was rarely seen without her elbow length gloves, decorative hats and elegant heels on at all times. The weather conditions, coupled with the unrelenting schedule of engagements, would have been taxing on the Royal couple who were still familiarising themselves with their new roles and responsibilities. 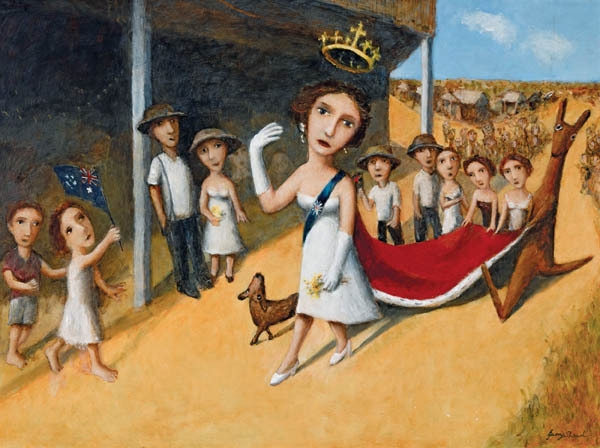 Art historian, Sasha Grishin, refers to the figure of Queen Elizabeth in Shead’s Royal series paintings as ‘absurd’4 - she is completely at odds with this strange, alien environment as she travels through the country, coming face-to-face with some of the native wildlife.